EARLY reports are the body of the South Korean national who drowned at Woolgoolga Beach on Saturday evening has been found. 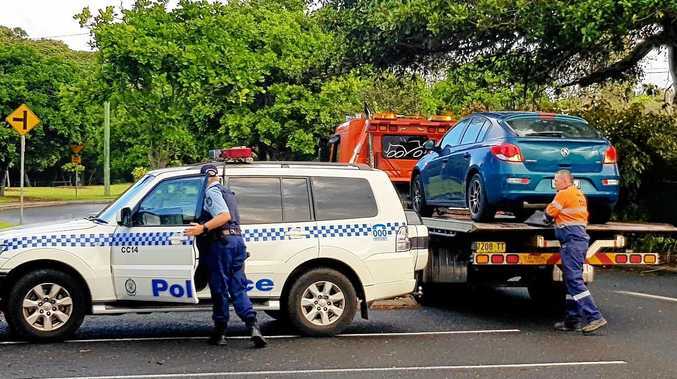 Full details are yet to be confirmed but it's believed a walker found the body of 23 year-old Yong Jong Lee washed up onto Safety Beach this morning. A three-day search for the tourist began shortly after he was reported missing, feared drowned after being caught in a rip at Woolgoolga's main beach and dragged out to sea. A large-scale sea, air and ground search failed to find the body before the search was cancelled on Monday evening due to dangerous suerf conditions. LARGE swells has seen police divers call off a search for a swimmer lost at sea at Woolgoolga. A three-day search for Yong Jong Lee, a 23 year-old Korean national, began late on Saturday afternoon when he was caught in rip at Woolgoolga's main beach and dragged out to sea. In that time a large-scale sea, air and ground search has been conducted but no body has been found. The large ocean conditions are not expected to improve until the weekend. INCLEMENT weather conditions are hindering the search for the South Korean man lost at sea off Woolgoolga Beach. Yong Jong Lee, a 23-year-old South Korean national, is thought to have drowned after he disappeared in the surf on Saturday afternoon. Police and members of the volunteer search party fear the worst given Mr Lee was last seen struggling to stay afloat. He arrived in Australia just weeks ago on a temporary work visa to pick blueberries. The search was today downgraded to a land-based effort. That decision was made following an extensive land, sea and air search over the weekend. Police said Mr Lee and a 30-year-old Korean man got into trouble in a rip while swimming on Saturday around 5.40pm. Vigilant beachgoers heard their calls for help and responded. Troy Brown was on the beach with his family when the drama unfolded and took to the water. "A couple of young blokes on bodyboards and a female surfer came out and we dragged him back in," Troy said. "Other guys went out to get his mate, but they couldn't find him. The 30-year-old man who was rescued was hospitalised. Once he was cleared to leave he returned to the beach to pay his respects to Mr Lee. The men had met just days before the tragedy. Woolgoolga Police Sergeant Peter Saunders said the Korean Embassy in Australia has notified Mr Lee's family. Srgt. Saunders said police divers were due to join in the search for Mr Lee's body tomorrow however, strong southerly winds could limit the divers' ability to take to the water. "There was a small window of opportunity for the police divers to travel up and take to the water today, but for that to have happened they would have had to have flown and then they would not have been able to dive due to compression from the flight," Srgt Saunders said. "Now that strong winds have blown up along the coast, it's unlikely they will be able to dive tomorrow, so the land based search will most likely continue. Marine Local Area Command officers have used dye to track and simulate ocean currents. The drowning came just three days after locals Anika Morgan, Luke Featherstone and Rhiannon Glattback made front page news for saving four Korean backpackers, who got into trouble in the surf on Woolgoolga Beach. Locals and beachgoers should reported all sightings to 000. THE search continues this morning for a missing swimmer last seen in trouble in the surf off Woolgoolga Beach on Saturday afternoon. The family of the 23-year-old South Korean national has been advised of the tragedy. Police said he and another man, also a Korean national aged 30, got into trouble on Saturday around 5.40pm. The men were caught in a strong rip and were dragged away from the beach towards the headland. Members of the public including local body boarders went to their aid and a 30-year-old man was pulled from the surf. He was brought back to shore and treated at the scene by paramedics before being taken to Coffs Harbour Health Campus. After his release from hospital the 30-year-old return to the beach to mourn the death of the other backpacker. The men had met just days earlier after arriving on the Coffs Coast to pick blueberries. A search for the body of the 23-year-old was conducted and suspended at last light on both Saturday and Sunday evenings. Rescuers resumed again at first light this morning. Police are hopeful the man's body will be recovered today. Officers and a volunteer search party will continue to search the foreshores today and if the man's body is not found police divers will be engaged tomorrow. 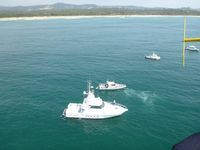 The search has also involved the Coffs Harbour-based Marine Area Command vessel Fearless and volunteers from the Volunteer Marine Rescue and Woolgoolga Surf Life Saving Club.